Officially known as the Principality of Liechtenstein, LIECHTENSTEIN is a tiny yet wealthy country located in Central Europe. Liechtenstein is the world's sixth-smallest sovereign state and its population is slightly over 37,500 (2015 estimate). Not only does Liechtenstein maintain one of the world's high GDP per capita, the small principality is the world's largest exporter of dentures! Featuring a constitutional monarchy and principality government, Liechtenstein is located northeast and east of Switzerland and west of Austria. It is only about 160.5 square kilometers (62 sq. miles) in total area and 22 kilometers (13.7 miles) long. Sovereign independence was permanently achieved in late August 1866 when the German Federation dissolved due to the Peace of Prague treaty agreement. ● ● ● ● ● People and Places ● ● ● ● ● Liechtenstein's official language is German, while Roman Catholicism is the dominant religion. A majority of residents specifically speak an Alemannic dialect of the German language, while over 86% (2014 statistic) of citizens live in rural areas. About 80% of Liechtensteiners identify as Catholic Christians. 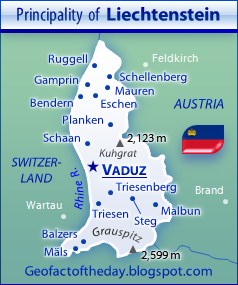 The capital of Liechtenstein is Vaduz, which only has about 5,300 residents. Located in the southeast section of Vaduz, Vaduz Castle (Schloss Vaduz) is the stately home for the prince and his family members. As of 2016, the city of Schaan serves as the home for about 5,700 residents. Other communities include Balzers, Bendern, Eschen, Mäls, Planken, Steg, and Triesen. Like their Swiss neighbors, Liechtensteiners use the Swiss Franc as their currency. The Swiss Franc's ISO 4217 currency code is CHF. In regards to voting, women could not elect Landtag lawmakers until 1984. ● ● ● ● ● Land Features ● ● ● ● ● Liechtenstein straddles the Alps' northern extent and is the westernmost part of the Central Eastern Alps. Southeastern Liechtenstein is the most hilly and mountainous. Located on the southern border with Switzerland, Vorder-Grauspitz — or simply Grauspitz — stands 2,599 meters and 8,527 feet above sea level and is the country's highest point. Sometimes misspelled Ruggleller Riet, Ruggeller Riet is Liechtenstein's lowest point at 430 meters and 1,411 feet above sea level. Ruggeller Riet is a nature reserve featuring peat bogs, wetlands, a myriad of plant species, and nesting sites for rare birds. According to Ramsar (Convention on Wetlands), this nature reserve is located at 47° 15' N, 9° 33' E — northeast of Ruggell in extreme northern Liechenstein. The Rhine River forms Liechtenstein's western border, while the Haupt Canal runs parallel (north-south) to it and past communities such as Bendern, Gampren, Ruggell, and Vaduz. The Samina and Valorschbach rivers flow in the eastern region. 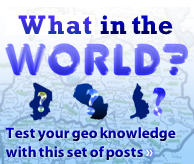 GeoFact of the Day Blog updated this post with a map on October 23rd, 2016.